There is evidence that the training institute has provided a set of bylaws and policies and procedures to insure a well-operated training institute (e.g., prevention and handling of sexual harassment). The applicant provides the Commission with the appropriate accreditation application forms and fees. There is a commitment to communicate with the Commission any additions or changes in the training institute including the addition or deletion of instructors. There are clear procedures for notifying the Commission about student who take courses and verification of those who complete all requirements of the sanctioned certifications. There are clear procedures for handling student inquiries and requests for assistance. There is a commitment to communicate regularly with the Commission staff regarding issues of mutual interest including applications for new courses. There is a commitment to protect the trademark/logo of the Academy, the Commission, and its certification and accreditation programs. There is a commitment to respect the geographic region agreed to regarding marketing (Site/Program Directors are allowed to market in surrounding states where no other sites are accredited) and teaching and that the program will work cooperatively with other training institutes in sharing materials and other resources. There is a commitment to developing supplementary material aimed at improving/enhancing the curriculum. There is a commitment to informing the Commission of its schedule of course offerings (with the goal of having regular cycles of course offerings scheduled at l6 months in advance so that the Commission can announce them on its web site.. There is a commitment to conducing evaluations/critiques of each class, and providing in the annual report a summary evaluation after each series of course offerings. 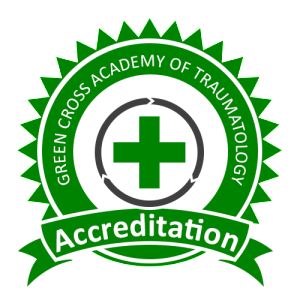 There is a commitment to inform participants of the procedures for becoming a Certified Traumatologist and have available the Commission applications for dissemination to participants. There is a commitment to informing the participants of the value of joining the Red Cross as a volunteer or the Green Cross as a consultant. There is a commitment to including the standard liability disclaimer in courses and material that will be supplied by the Commission. There is a commitment to submitting an annual report in a form specified by the Commission at the time of annual renewal. There is a commitment to pay a fee of $1500.00 with the application for becoming an accredited training institute and an annual accreditation fee of $350.00 payable each year following. There is a commitment for Site/Program Directors to set course fees at its their discretion, based on their experience, costs and best assessment of the local market. The Institute can provide model course budgets upon request. There is recognition of the right of the Commission to monitor the accredited programs regarding the above standards and place program on notice of violation of standards if violated. There is recognition of the right of the Commission to terminate accreditation for cause as determined by the unanimous vote of the Commission. There is a recognition of the right of the Commission conduct an annually review of the status of all accredited training institutes. There is recognition that the Commission assumes no liability, financial, legal, or otherwise, for any of the accredited programs.